LAFM: How many years have you been coaching? How many years at Hannan? I have been coaching for 38 years. I am starting my 5th year at Hannan. 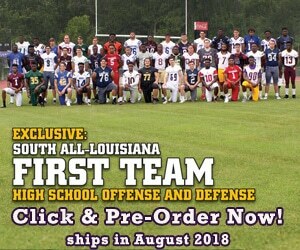 University of Louisiana Monroe, Covington High School, Amite High School, Slidell High School, and Northshore High School. LAFM: What pushed you into coaching? The love of the game which is more than just a game. I love working with young people. I think it’s one of the best in the country, no doubt about it. There are so many small communities in Louisiana where football is their sport. It is their sport from when they first grow up playing it, all the way through watching it in their adult lives. I think that everyone in a small community loves football and it means a lot to the community to be together. Because I did that recruiting process, I always tell my guys to enjoy the trip. Enjoy being recruited. In the end, it’s going to be your decision and no one elses. LAFM: What is your favorite college or professional football coach and why? Probably Bear Bryant. He was not just a coach, but he was a mentor for a lot of people. He did a lot for his players and he did a lot for the schools. Whether he was at Alabama or Texas A&M he always went the extra mile. Even when players could no longer play football and therefore couldn’t afford to go to school anymore he would pay for them to be able to finish. NFL would be John Laurinaitis simply because he was a great competitior not just a great player. LAFM: What makes Hannan a great school and a great football program? Everything about the school itself, not just the football program. It’s everything that Father Charles brought over here when he came here four years ago. It’s more of a family atmosphere. He wants everyone to be accountable to each other and that creates a nice environment. LAFM: What are you looking forward to with this upcoming season? We are rebuilding that is for sure. We lost a lot of great players who really worked hard their four years. They got beat up in ninth grade, but they never quit. You have to establish that kind of attitude “it’s going to be tough, but if you keep working together you can move mountains”. That’s what we had the opportunity to do, and what we did do last year. LAFM: What are some key players for Hannan this upcoming season? The guys that were in 8th grade that are seniors have now been with me for five years. Daniel Hollander is one of the key guys for us, he is a Wide Receiver. He caught fifty passes last year, ten of which were touchdown catches. He’s 6’4” right at around 200 pounds. On defense, Mitch Morel (#53) plays defensive tackle. He was a very undersized guy growing up, but he’s gotten a little tougher, rougher, and faster. We expect a lot out of Mitch for sure. At cornerback we have Griffin Hakenjos. He is a great hitter and our best cover guy. Those three guys started with me in 8th grade, and they are still around. They were big for us for four years, and they are still going to be big this year. Hopefully they will lead us somewhere. All of our seniors will lead us, the eight others are also important. LAFM: What is some final advice you have for the guys? Play hard. Remember what the seniors did last year. Help the younger guys out. I still have the same staff that started with me four years ago, and that has been really nice. De La Salle. They aren’t in our district, but they are one of the best teams in New Orleans. They have some great players, and when you play great players it helps you out also. They have some talented players for sure. Pine also has some really talented players such as their quarterback, Riverdale as well. The biggest one is the kid that committed to LSU from St. Thomas Aquinas. Our district is just loaded with talented players, all those Division 1 players. De La Salle has 4-5 of those players coming up in the next few years. We will have to work hard.